Add new dog breeds in your Minecraft worlds . Copious Dogs 1.6.4 is a mod that is responsible for generating new dog breeds in the game. Now we know we can only find wolves , while by adding this mod we can get up to eight new breeds. These breeds are German Shepherd, Husky, Bernese Mountain Dog, Beagle, Chihuahua, Golden Retriever, Dalmatian and French Bulldog . These dogs can be tamed using special cookies. But if we want our pet to follow us , we use a collar and leash . Our pets can get hurt , so we feed them to regain health. You can not feed them directly, we should youse a dog plate and feed them with pork. The breeding of these dogs should be done around the fire or near a torch and give cookies to both. We can name them using Name Tags . You can not mix the races yet. 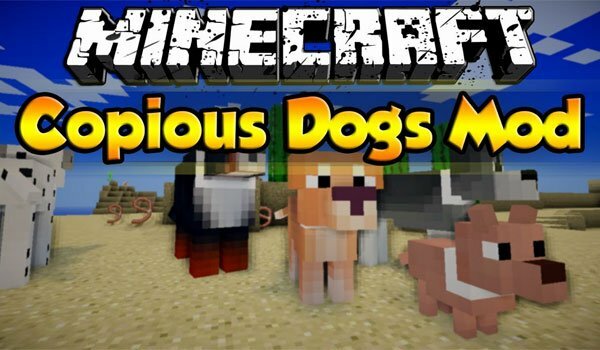 How to install Copious Dogs Mod for Minecraft 1.6.4? Up to eight new breeds of dogs in Minecraft!